Whether you’re heading to the Bahamas to party or relax against the backdrop of sandy beaches and the sparkling ocean, there’s a lot to know before booking your villa or rental property. Use the information on this page to learn which Bahamas islands specialize in water sports and which are known for shopping, and find out tons of other useful information as well. The first settlers were originally from South America and arrived in the Bahamas in the Ninth Century. They were known as Arawaks or Lucayans. English settlers left Bermuda in 1647 and formed the first British colony on the island of Eleuthera and began a prosperous agricultural economy that still thrives today. The geography of the islands attracted many well-known pirates such as Blackbeard, Henry Morgan, and others who dominated the islands for the next 70 years in what was known as “The Golden Age of Piracy.” Britain claimed the islands in 1670 and the first governor finally drove the pirates out in 1718. Britain then recognized the Bahamas as a colony. Great Britain granted the islands their independence in 1964. In 1973, the Commonwealth of The Bahamas became independent, but retained Queen Elizabeth II as constitutional head of state. 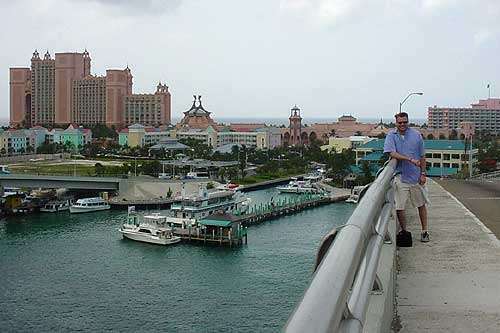 From Nassau you can see a giant arching bridge. Scale this 1/4-mile monster and you'll run right into the world-famous Atlantis hotel, frequented by celebrities. Some don't leave the resort; there's so much to do inside - 35 restaurants and bars, miles of pools, rivers and lagoons, a theater, shopping and a huge marine habitat. Branch out and you'll find sparkling white-sand beaches spooning the crystal, clear turquoise water. Jump in for a day of snorkeling, diving or a dolphin swim. On land you can tee off at one of two spectacular golf courses. If you still have some energy come evening, there's plenty for night-owls like the 9,000-square-foot nightclub called Aura or try your luck at the 2 largest casinos in the Caribbean. 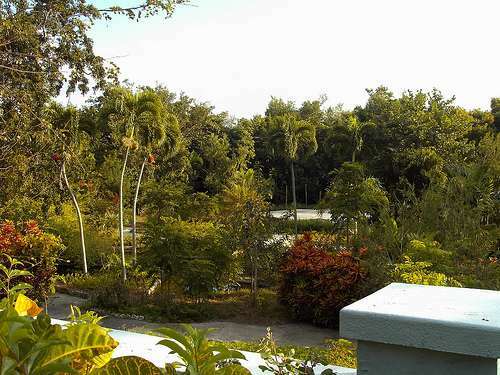 The Grand Bahamas Garden of the Groves is home to over 12 acres of exotic wildlife and botanical gardens. It's the most photographed spot in the Bahamas and frequently used for weddings ceremonies. Children come for the farm animal petting zoo. There are also parrots, alligators, ducks and turtles and hundreds of tropical plants. Garden of the Groves is located on the corner of Magellan Drive and Midshipmann Road on Grand Bahama Island. It is open Monday through Saturday from 9 a.m. until 4 p.m., and Sundays from 10 a.m. until 4 p.m. Admission is $3.95 for children 3 through 10 and $9.95 for adults. 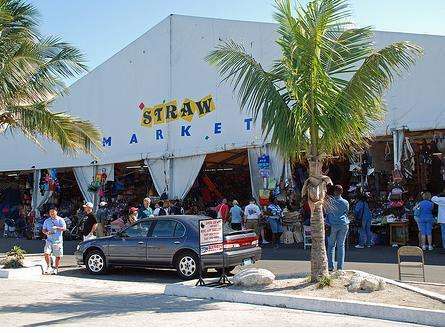 Venture into the heart of Nassau, near Bay Street Shopping Center and George Street, and you'll find the Straw Market tent. Here you can shop for handcrafted Bahamian treasures including signature straw hats, beautiful handmade woodcarvings, tubs of Guava Jelly and other island souvenirs. You might also run into vendors selling knock-off Rolex, Prada, and other luxury items. Just don't be shy about bargaining. Those that don't usually over pay. Open 7 days a week from about 7am to 8pm. Getting to Bahamas and getting around. Our transportation tips will help make your trip smoother. More good sand advice. Proof of citizenship (passport, birth certificate and photo I.D. in the form of a driver's license) and a return or ongoing ticket. British and Canadian citizens may enter without passports or visas. American, Delta, British Air connects the Bahamas through Miami and Fort Lauderdale. Bahamasair flies from Miami to Nassau and Freeport. Lynden Pindling International Airport, the main airport formerly known as Nassau International Airport; six airports exist among the many islands - numerous flights from the U.S. Vacationers don’t just stay in Bahamas villas - they come to paradise to get married and celebrate their honeymoons! An affidavit available at the U.S. Embassy in Nassau must be completed. Cost: US$120 for a marriage license. Documents Required: Passports or birth certificates plus divorce or death certificates, if applicable. Before making their way to Bahamas villas, vacationers like to know a little bit of helpful information to make them feel more at home during their stay. Take a look at our travel tips to make your time in villas in Bahamas even more relaxing.